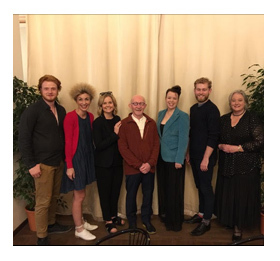 Ben Reason, Elisabeth Harris, Joanna Foote, Maestro Wyn Davies, Joanna Heslop, (Deputy New Zealand Ambassador to Italy), Harry Grigg, Patricia Hurley, before the Concert at Stanza Ulvieri, Montevarchi, Tuscany. Patricia Hurley has been organising her Masterclasses and Concerts for New Zealand opera singers in the beautiful 18th century Villa Petrolo in Tuscany since 2002. Over 60 of New Zealand’s top young opera singers have attended this unique course, performing to Italian audiences in stunning locations, and visiting places associated with the great Italian composers and their iconic opera theatres. Because learning Italian is so necessary for opera singers and because there are limited learning opportunities in New Zealand, Patricia, after being manager of the Wellington opera company and with a background as an Italian speaker and living in Italy, decided to seek opportunities for singers to be introduced to the birthplace of opera, its language and culture and to perform on Italian stages. This year our performers were soprano Joanna Foote from Berlin, mezzo soprano Elisabeth Harris from New York, tenor Harry Grigg from Auckland and baritone, Benjamin Reason from London. Each day they had intensive language lessons with our favourite language teacher Giancarla Bindi from nearby Siena and individual coaching with Maestro Wyn Davies. Our three Concerts in the Villa in Tuscany, the nearby town of Montevarchi and the Teatro F. Torti in Bevagna, Umbria were triumphs with our performances of solos and duets from Handel, Mozart, Donizetti, Rossini, Tosti and Verdi. The singers were very grateful for scholarships received from generous individuals, the Greenlea Foundation Trust and Dame Malvina Major Foundation. In 2007 Patricia was awarded the Italian honour of Cavaliere, Order of Merit of the Republic of Italy, for services to the promotion of culture between Italy and New Zealand.